Either the cupola or gable mounting post is included with your weather vane along with the directionals and the guard dog. Let us know which one you need. John's weathervanes come complete with a mounting post, brass directionals, and his trademark "Guard Dog ". The directionals are solid brass, as shown, and are held in place by set screws. The mounting posts are made from 1/2" steel rod and come in 2 types. The first, shown on the left side of the picture, is for installation on a cupola. This rod is 31" long, is threaded, and comes with brass nuts and steel washers for locking in place. The second mount, shown on the right side of the picture, is for mounting the weathervane on the ridge cap of a sloped roof. The angled steel plate is 1/8" stock and is 8" in long. There are holes on each of the four corners for lagging the mount to the roof. Check below for more on cupola instalation, gable or other sloped roof instalations, and the Guard Dog. For mounting on a cupola, the mounting post is a 1/2" steel rod. This rod is 31" in length and is threaded on one end. 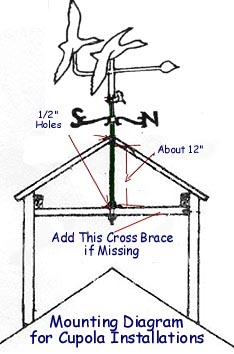 It comes with brass flat washers and nuts to firmly attach the base of the rod to the cross brace as shown in the diagram. It is important that the post be truly vertical in the finished installation. Once the post is in place, the directionals will slide down the post from the top and are secured with set screws. John's trademark "Guard Dog" and the weathervane with its ball bearing will then slide down over the post as well. For mounting on a sloped roof with a ridge, the mounting post is a 1/2" steel rod. This rod is 28" in length and is welded to an angled steel plate. The angled steel plate is 8" long and is made from 1/8" stock. Holes drilled at each of the four corners for screws or bolts. Since there are so many different roof materials and thickness, no screws or bolts are included. It is important that the post be truly vertical in the finished installation. Once the post is in place, the directionals will slide down the post from the top and are secured with set screws. John's "Guard Dog" and the weathervane with its ball bearing will then slide down over the post as well.